Marker labels are basically software name tags that are assigned to trajectories of reconstructed markers so that they can be referenced for tracking individual markers, rigid bodies, or skeletons. 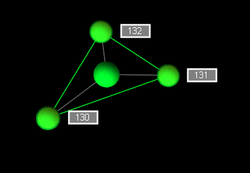 Motive distinguishes labeled marker trajectories from other 3D reconstructions within a capture using the assigned labels. 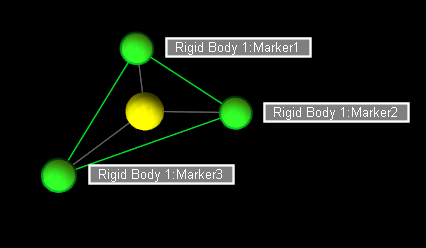 Labeled trajectories can be exported individually, or used (solved) altogether to compute positions and orientations of the tracked assets. Thus, in general, all of the target 3D markers need to be labeled in Motive. There are two methods for labeling markers in Motive: auto-labeling and manual labeling. Both labeling methods will be covered in this page. From the 3D perspective viewport. Marker Labels must be enabled for viewing under the visual aids ( ) options. The Labeling pane lists out the marker labels for each of the involved labels and indicates their corresponding percentage completeness. 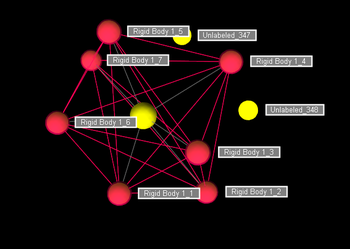 The scrubber in the Graph View pane gets highlighted in red for frames where the selected markers are unlabeled. 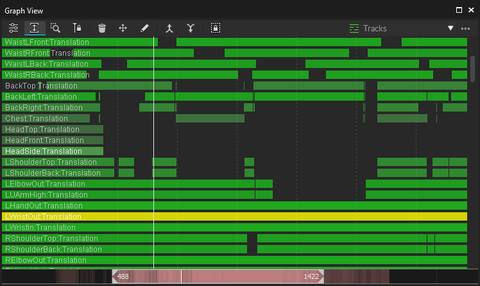 The Tracks View in the Graph View pane gives a list of labels and their continuity in a captured Take. 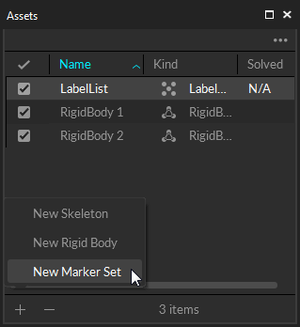 Auto-label: Automatically label sets of rigid body markers and skeleton markers using corresponding asset definitions. 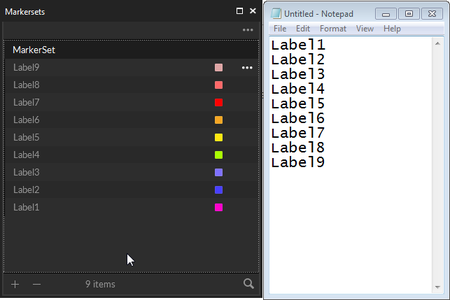 Manual Label: Manually labeling individual markers using the Labeling pane. 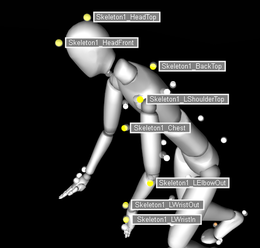 When tracking rigid bodies and skeletons, Motive can automatically label associated markers both in real-time and post-processing. 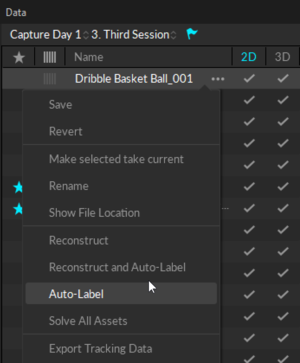 The auto-labeler uses active asset definitions to search for related markers and labels them with pre-defined names throughout each frame of 3D data. 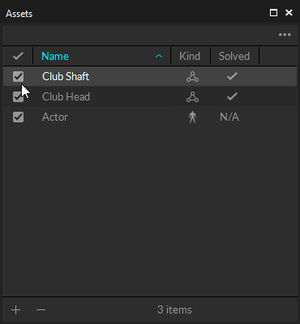 Using the auto-labeler, it wouldn't be necessary to individually assign marker labels for trackable assets. There are times, however, when it is necessary to manually label a section or all of a trajectory, either because the markers of a rigid body or a skeleton were misidentified (or unidentified) during capture or because individual markers need to be manually labeled. In these cases, the Labeling Pane in Motive is used to perform manual labeling of individual trajectories. 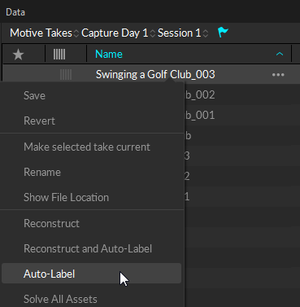 Manual labeling workflow is supported only for post-processing of a capture when a Take file (TAK) has been loaded with 3D data as its playback type. In case of 2D data only capture, the Take must be Reconstructed first in order to assign, or edit, the marker labels in its 3D data. This manual labeling process is typically referred to as post processing of recorded mocap data along with the process of editing reconstructed marker data. 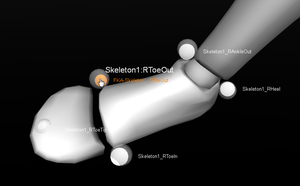 For more details on editing 3D data, see more in the Data Editing page. Rigid body and skeleton asset definitions contain information of marker placements on corresponding assets. This is recorded when the assets are first created, and the auto-labeling pipeline in Motive uses them to label a set of reconstructed 3D trajectories that resemble marker arrangements of active assets. Once all of the markers on active assets are successfully labeled, corresponding rigid bodies and skeletons get modeled in the 3D viewport. Following tutorials use Motive 1.10. On Motive 2.0., Data Management pane and Assets pane is used instead of the Project pane.